(MoneyWatch) Forget gold or German government bonds -- one of the year's best investments may turn out to be made of humbler stuff: hay. Demand for the dry grass is rising as the epic drought torching U.S. farmers diminishes hay production and doubles its cost in some parts of the nation. The rising price for this key, if usually little noticed crop, also suggests that consumers will likely see higher food costs in the coming months. Hay prices are very localized. Unlike other commodities, hay is hard to standardize, with bales coming round and square, dry and moist, and made up of plants as varied as alfalfa, brome and timothy. As a result, hay futures aren't traded on national exchanges. This makes nationwide statistics hard to find, and in areas unaffected by the drought prices remain stable. Goldman dodges SEC bullet over bum mortgage dealIs the U.S. economy healing or coughing blood? In states such as Iowa and Illinois, however, the price of bales at auction has more than doubled over the past year, according to spot reports from the U.S. Agricultural Marketing Service. In Rock Valley, Iowa, last week, the price of a ton of hay was more than $300, up about 150 percent from the same time last year. The cost of high-quality alfalfa bales has more than doubled in a year in Congerville, Ill., and in Missouri prices have risen as much as 70 percent. In another drought-scorched state, Texas, alfalfa bales that were selling for $8 to $9 at this time last year now cost $2 more. Trade publication Drovers Cattle Network reports the the all-hay price in July was $184 per ton, compared to $170 per ton a year earlier. July alfalfa prices this year have increased from $189 per ton to $198. The July estimate for hay other than alfalfa and alfalfa mixtures is $143 per ton, up from $133 in June and up significantly from the July 2011 price of $119 per ton. Farmers use hay to feed cattle when they can't just graze, usually in the winter. 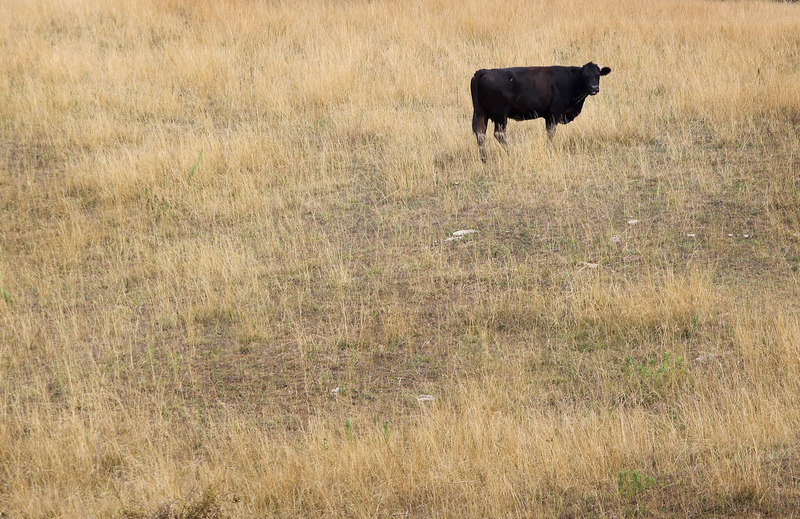 But the drought, which is expected to last at least until November, has made grazing all but impossible. Severe conditions in 33 states across the West and Midwest have destroyed plants from corn to grass. So ranchers are seeing prices skyrocket. The harvest of alfalfa, generally considered to make the best hay because of its high nutrient levels, is forecast to be the worst since 1953, according to the USDA.